I rarely offer any personal or contextual preface to my critiques, but it seems particularly prudent going into this review to clarify it as having been not only my inaugural opera review, but also indeed my first opera viewing experience. I have always afforded the form the utmost of respect from an outsiders perspective, not to mention a growing intrigue and curiosity that shall hopefully lend this review an added relevance and purpose to those readers out there who may similarly have never been. 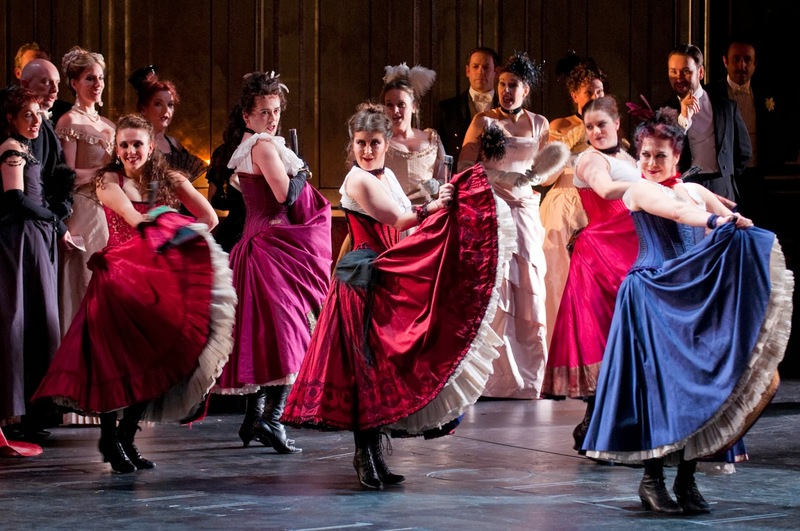 I was fully aware of the prestige and repute of La Traviata, and likewise that of the Welsh National Opera, who bring their ‘Fallen Women’ programme to the Birmingham Hippodrome this month, accompanying Traviata with Boulevard Solitude and Manon Lescaut. 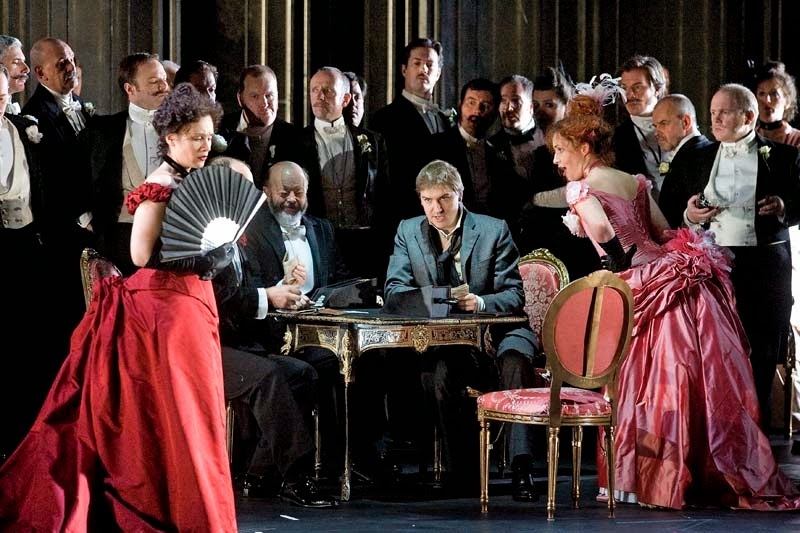 One of the more prolific and regularly performed of operas, WNO’s La Traviata is a soaring, stunning introduction to the form that swept me into the opulence, grandeur and surprising accessibility of opera in the most gloriously confident and majestic manner. The three act tale follows the romantic turbulence and odyssey of Violetta (Linda Richardson), a high-profile Parisian courtesan, and young nobleman Alfredo (Ji-Min Park in the reviewed performance), whose blossoming love is forced to endure the disapproval and interferences of Alfredo’s father, Giorgio (Alan Opie) and Violetta’s waning health due to Tuberculosis. Based on the novel and subsequent play La dame aux Camelias, La Traviata is suitably grandiose and melodramatic in execution, but as mentioned a deftly accessible and emotive piece of storytelling; an innately human tale laced with sacrifice, hypocrisy and a beautifully observed and dynamic central relationship which is given a new vantage and perspective with each act. From the first act’s boisterous, youthful flirtation and excitement, to the second act’s wrenching futility and despair all the way through to the cathartic and re-animated defiance of the finale, Violetta and Alfredo’s tale is a sumptuously layered and, as mentioned, intensely human experience. As a newcomer to opera and the tale of La Traviata, it was remarkable to see the genesis of so many shows, musicals, novels and even films evident here. From Pretty Woman through to Moulin Rouge!, it is again testimony to the quality and impact of Traviata’s central narrative that it has gone on to be adapted to such popular effect. Violetta’s act II predicament, forced to spurn the man she loves for what she is conditioned to believe to be his best interests is powerful, stirring and deeply moving. The friction and tone of a party afterward where Violetta, her re-acquainted financier/lover Baron Douphol and Alfredo all share the same space crackles with a tension and frisson that immediately cuts through the former festivities and celebrations. And finally, Violetta’s final aria, sang from what must surely be her death bed, rings not of desperation or finality, but an indomitable will to rise again and drag herself up and out from her physical failings. 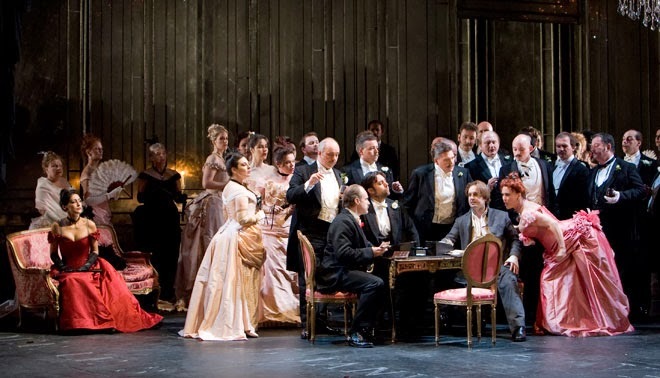 Simply tremendous through and through, the craft and attainment with which the Welsh National Opera bring La Traviata to life is never short of exquisite. Sumptuous costumes are met with suitably glorious and ambitious staging and set design, crafting an utterly convincing, faultless sense of time, place and mood that is of the highest imaginable calibre. Having been to many plays and musicals, La Traviata is, with confidence, one of the most transformative and transportive theatre experiences I have had the pleasure of experiencing, and an impeccable standard thankfully extends to the superbly talented company who unknowingly gave what can only be described as an enchanting and beguiling introduction to opera with their turns in La Traviata. Alan Opie took us on a visible journey and emotional trajectory with Giorgia, the conflict of a father weighing up the best interests of his children, followed by his later regret and remorse beautifully depicted and felt with sincerity and gravitas by Opie. Ji-Min Park offered a brash, youthful urgency with Alfredo, radiating idealism and naivete which worked perfectly given the weight and sacrifice he unwittingly puts upon Violetta in Act II. Linda Richardson gave a blisteringly strong performance as Violetta, crucially anchoring her as a figure of empathy and indeed sympathy throughout, and charting her gradual decay and deterioration with utter conviction, treading an expertly judged and beautifully observed balance between physical frailty and indomitable will, as well as a commanding control on her vocals at a stage in the story where they could seem unrealistic or inconducive to the characters circumstances and condition. In all, La Traviata is a beautiful, moving and thoroughly engaging piece brought to the stage in exemplary, inviting fashion by the Welsh National Opera. For those unacquainted with opera, it is a lavish feast for the senses, yet one that is incredibly accessible and universal enough for newcomers like myself to feel fully involved and invested in with relative ease. The additional inclusion of surtitles, carefully positioned above the stage so as not to be obtrusive for those who do not wish to use them, is an added aid to those who may opt for La Traviata as their introduction to the art form, and given the stunning, sweeping work done here by the incredible talents at Welsh National Opera, it is an introduction this fellow opera initiate wholeheartedly recommends. LA TRAVIATA, as well as accompanying WNO productions MANON LESCAUT and BOULEVARD SOLITUDE are running at the Birmingham Hippodrome until Saturday 8 March. Press tickets for this performance of La Traviata were provided courtesy of the Birmingham Hippodrome and Welsh National Opera directly. (A)musings Media gratefully acknowledges their generous invitation.